Great choice thanks Anne. I made mine a bit smaller as well - the lid from a box of icing tips was my cutter! I loved this tart. This was such a great choice. It has become one of my favorite Ina recipes! Thanks Anne, these were great. I like that you can use seasonal veggies. Yours looks great with the peppers! Great choice! It was delicious! Awesome pick, Anne! I bet they were great with the bell peppers. This one is so versatile, I know we'll be having these a lot on busy weeknights. Thanks for choosing such a winner for us! You picked a good one Anne. Can hardly wait to make it again with other ingredients and a lower oven temp. I made some similar changes to my tarts as well by making them smaller and using chicken stock instead of wine. I usually don't like goat cheese but actually enjoyed these. Good pick! What a great idea using the cd cover! I loved this recipe...I skipped the puff pastry and used a pizza dough instead. Great pic Anne!! I love yours with the peppers...they look awesome!! I have waited all week to comment on this dish. Thanks for the great selection and I like your spin of using peppers. This was a great choice! We really enjoyed these and I love that the recipe is so versatile based on what veggies you have on hand. These look so delicious! I guess you can never go wrong with an Ina recipe. I love that you subbed bell peppers for tomatoes--although I'm a fan of both, I think the bite in the pepper would make for an EVEN better tart. Plus, who doesn't love goat cheese?! Thanks for the great choice Anne! We really loved it. Yours look amazing, bell pepper was a good idea! Thanks for picking such an amazing recipe! This was my first with Barefoot Bloggers and I was so happy! Your tarts look great! This turned out beautifully!!!! Thank you for a wonderful choice! And nice job on finding something as the "template" I couldn't find anything in my cupboard that was near the right size until I just HAPPENED to find my 4 cup Pyrex measuring cup...it was a PERFECT size! Thanks again! Thank you, thank you, THANK YOU Anne!! I followed the recipe exactly and was completely blown away. I love Ina for the recipe, and you for picking it. Love your bell pepper version! EXCELLENT choice my dear! We really did enjoy them... just wish I had made them in my tart pans. OH! We love goat cheese! I'm going to have to try it! I love Ina's recipes and her show on Food Network....your tarts look great! I love goat cheese. This is something right up my alley. Sounds very very delicious. Love the photo! Looks like a different & unique dish to try. This was such a great pick. I loved all the flavors. I love the bright colors the peppers gave your tarts too. I threw some spinach in with my onions andit would be fun to experiment with other veggies too. Thanks for choosing them! They were a great pick - easy and tasty. I love your subsitutions too. I'll definitely have to try it with the peppers. YUM! Beautiful tart: love the colours in it! Thanks for the pick Anne! Your adaptation looks wonderful. We are big pepper fans around here...I'll have to try it! your red bell pepper looks like a butterfly. I love how the pepper slice looks like a butterfly! Great pick Anne! I couldn't wait to try this and then I forgot this week so I made them last night. We really enjoyed them. I would love your version, but unfortunately my DH would not. He hates peppers!! Love the change-up to bell peppers - it makes it look so bright and cheery. You're a girl after my heart. This was a super recipe made from things I LOVE! I agree, Ina can really put together some terrific recipes. I think bell peppers would have been a great addition too! This was an awesome choice! I'm so excited about the endless possibilities with this recipe. These were fantastic. 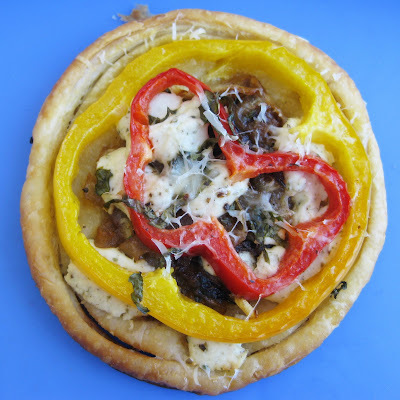 Your tart looking so delicious Anne, love bell pepper and goat cheese together. The peppers were a great substitution. Hard to get decent tomatoes this time of year. Great pick! Let me jump on the wagon and say thank you as well. These were really good and easy. Great choice! I never would've tried this recipe on my own. It was soooo good! loved this one. Thanks for the pick! This was my first time cooking with goat cheese and I was quite happy with this recipe, thanks Anne. I made mini sizes also, using small cookie cutters and just one shallot for the entire recipe. That was fine for ONE person, for my dinner. Great choice! Great choice Anne! I love the versatility this recipe offered. Your look delicious! Mmmmm, this looks really yummy!